SANTIAGO DE CUBA, Jan 7 2015 (IPS) - Meat and vegetables are never missing from the dinner table of Damaris González and Omar Navarro, since they get almost all of their food from their farm, La Revelación, on the outskirts of the city of Santiago de Cuba, 765 km east of the Cuban capital. On the three hectares they have been working for the past seven years, the couple combine agroecological techniques with the rational use of natural resources, as they learned in the permaculture courses given in the city by the non-governmental ecumenical Bartolomé G. Lavastida Christian Centre for Service and Training (CCSC-Lavastida). “I used to grow just one or two varieties, especially tubers (staples of the Cuban diet). If we didn’t sell them or if the harvest was lost, we didn’t have much to survive on,” Navarro told IPS. The farmer is the coordinator of the local administrative committee of one of the food production microprojects organised by the religious organisation in rural areas in the eastern provinces of Camagüey, Las Tunas, Holguín, Granma, Guantánamo and Santiago de Cuba. When the initiative got underway with a local church in 2009, González and Navarro, along with another 10 ecumenical activists, received nine months of training on permaculture, agroecology, gender, business administration, food preservation, nutrition and other areas. “We had to ‘deprogramme’ ourselves to start using these techniques, because when you have planted the same thing in the same way all your life, it’s hard to believe it’s possible to diversify crops and stop using chemicals,” said Navarro, 52. The microproject gave them economic support to improve the infrastructure on their farm and buy livestock, in exchange for a commitment to donate part of their production to vulnerable segments of society, such as terminally ill patients, people living with HIV/AIDS, or the elderly. González, who is an engineer by profession but is now farming to boost her family’s income, believes their main achievement has been guaranteeing a balanced diet. “We use vermiculture (worm farming) and composting of organic material to make natural fertiliser, without chemicals, so our food is healthier,” said González, who runs the family farm, where the couple live with their 11-year-old son. They recently hired six workers who help them tend three fish farming tanks where they grow up to 5,000 red tilapia fry, rows of vegetables, different kinds of fruit, a seedbed, and 200 farm animals, including sheep, pigs, chickens, ducks and seven cows. “The community benefits from us being more productive because we sell the surplus at low prices compared to what is sold in the farmers’ markets,” added González, 48, as she showed IPS the booklet where she records the farm’s harvests by hand. With economic support and ongoing training, CCSC-Lavastida has been helping empower people in the countryside to produce food in an ecological manner, while encouraging the active participation of women, for the past 17 years. Agronomist César Parra told IPS that the institution, founded in 1995, has set up 87 microprojects with support from international Christian organisations such as Bread for the World and Diakonia-Swedish Ecumenical Action. Seventy percent of the microprojects involve food production and agriculture. In 2014, 32 were still active, directly or indirectly benefiting some 600 families throughout the entire eastern region, the poorest part of the country. Some of these groups have more than one system of permaculture – agriculture in harmony with local ecosystems, introduced in this Caribbean island nation in the 1990s in response to the ongoing economic crisis triggered by the collapse of the Soviet Union and the socialist bloc. “It’s about creating sustainable human settlements, following the ethics of caring for the earth, people and animals in a harmonious relationship and imitating the cycles of nature,” said Parra, CCSC-Lavastida’s projects coordinator. Based on the premise that everything can be reused, these systems of permanent agriculture make use of organic waste and manure as fertiliser, harvest rainwater, diversify crops, reduce energy use, increase greenery, create seedbeds and install biodigesters and dry toilets, among other techniques. 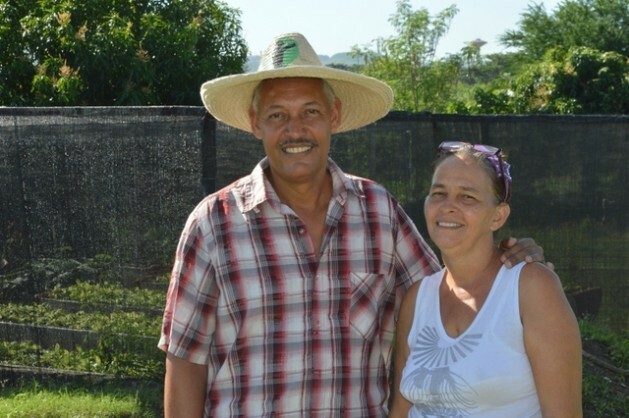 The Christian centre has trained 40 people to spread this philosophy and system in the eastern provinces of Santiago de Cuba, Guantánamo and Granma, who create gardens in urban patios, backyards and rooftops. 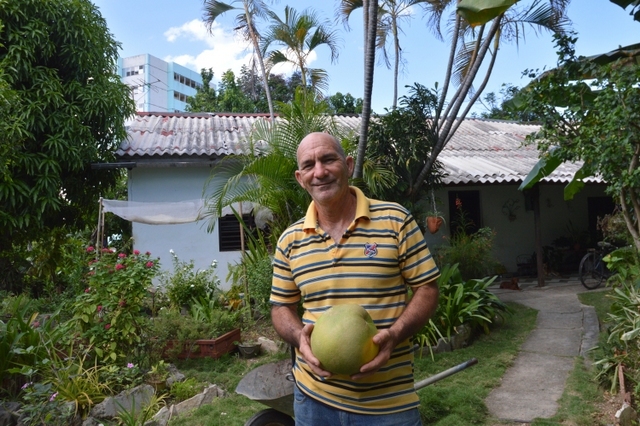 Fidel Pérez is one of those who has planted fruit and vegetables on every inch of soil around his house, in a neighbourhood in Santiago de Cuba. Pérez, who runs a local church, told IPS that he manages to supply his family of seven with tubers, fruit, vegetables and different kinds of meat, with what he produces. He estimates that he saves 17,000 Cuban pesos (710 dollars) a year, in a country where the mean monthly salary is 471 pesos and people spend between 59 and 74 percent of their monthly income on food, according to studies by local economists. Figures from the non-governmental Antonio Núñez Jiménez Foundation indicate that more than 1,000 people have been trained in Cuba as promoters of permaculture. “These people are assuming new lifestyles, with a closer connection to nature and greater sensibility and knowledge, to forge a beneficial relationship with their habitat,” says a recent article written by several specialists in the Foundation’s magazine, “Se puede”. Experts agree that the adoption of permaculture by rural and urban families can help provide solutions to Cuba’s food sovereignty problems. This is especially important when the authorities are attempting to boost agricultural production, as a matter of “national security.” In 2013, agriculture accounted for 3.7 percent of GDP, according to official figures. The National Statistics Office reported that of 6.34 million hectares of farmland in Cuba, only 2.64 million were under cultivation in 2013. Food imports absorbed 2.09 billion dollars in the first half of 2014, says a report by the Ministry of Economy and Planning to the Cuban parliament, which stated that 60 percent of that total could have been produced in this country. The sustainable production of food and seeds is top priority for the period 2013-2018 in the cooperation agreements between Cuba and the United Nations Food and Agriculture Organisation (FAO), whose goals also include adaptation to climate change and the sustainable management of natural resources.